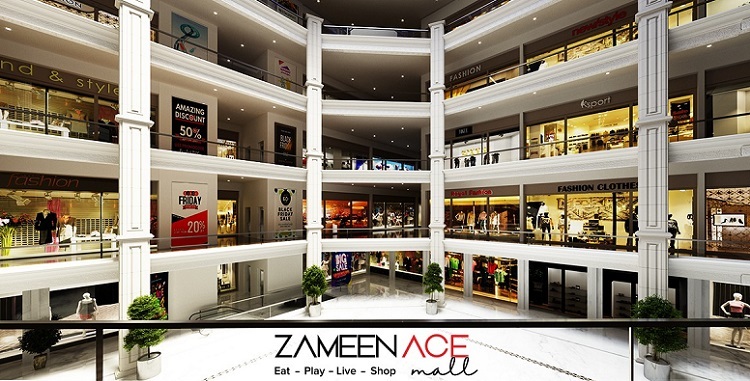 Zameen Ace Mall is ideally located on main Sir Syed Boulevard at Sector J, DHA Phase 2 Islamabad. This is the best location for such a project in DHA, as most of the commercial and residential projects in DHA Phase 2 are built by Al-Ghurair Giga which is located on GT Road. This location will have an advantage of having direct access through Islamabad Highway, so the commercial value of this property will keep increasing over time. Zameen Ace Mall is a 14 storey tall exquisitely designed robust apartments complex which appeals to investors, businessmen and home buyers alike. Three lower ground floors and ground floor will make a modern indoor shopping mall, first floor will be reserved for food court and restaurants, 2nd to 7th floors will be reserved for residential and hotel apartments, as well as split-level pent houses. Zameen Ace Mall & Apartments is planned to have all contemporary facilities for the shoppers and residents. Multi-level shopping mall will house multiple national and international brands, while the food court will offer different local and international cuisines to the foodies. Residential Apartments at Zameen Ace Mall will be a perfect address for home buyers. The apartments are both spacious as well as well-ventilated. High quality of tiles and sanitary fittings will be used in the kitchen and bathrooms, so that you can enjoy the quality living experience at the Zameen Ace Apartments. Hotel Apartments is a high return investment option for the investors, as the company guarantees 7% annual rental yield on the hotel apartments. So, whether you are a businessman, an investor or a home buyer, Zameen Ace Mall is a holistic package of opportunities that meets all of your needs. Bookings at Zameen Ace Mall start from 30% down payment, while 60% amount is paid through 48 equal monthly or 16 equal quarterly installments. 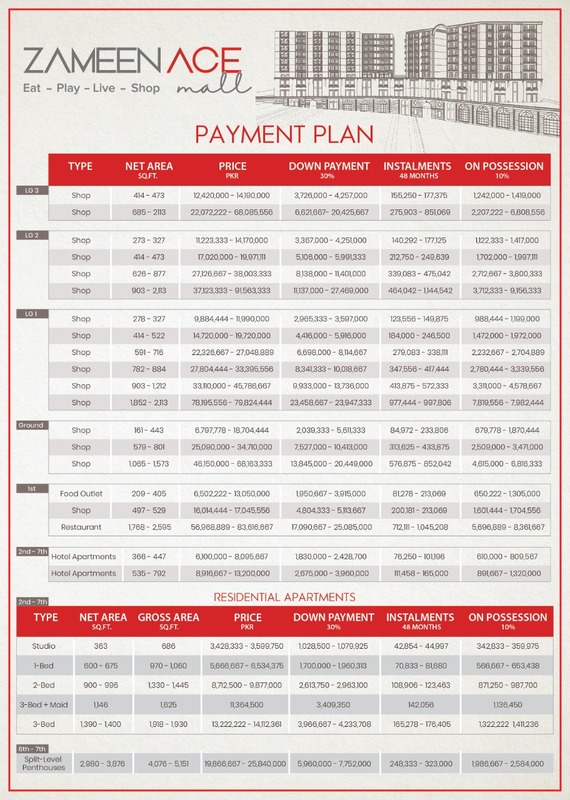 Remaining 10% amount is payable at the time of possession. Booking a shop or apartment in Zameen Ace Apartment is very simple. All you need to do is Contact Us with your requirement and we will share available options with you. Once you choose a unit, you can send us your documents and payment in order to finalize your booking. If you need more information on Zameen Ace Mall, feel free to contact us via email at marketing@manahilestate.com or whatsapp at 0345-5222253 for quick assistance.